From a sermon by Sheldon Tostengard (1935-2012), former Professor of Preaching at Luther Seminary, St. Paul, Minnesota. Holy Week is about facts. Scarcely anybody denies the facts of Jesus’ arrest, trial, suffering and crucifixion. Jesus’ death was and is an historical fact, an ordinary event exploded into timelessness by the reality of the resurrection. This passage about the woman who anointed Jesus with oil is full of facts, too. There are at least three. For one thing, Jesus predicted that we would always have the poor with us. And so we do. One certainly may grieve the presence of the poor, and Christians are called to fight poverty, but even a believer can scarcely imagine a world, on this side of heaven, where there are no poor. Second, it is a fact that Jesus is no longer with us in the flesh. To be sure, we now know him as our present, risen Lord, but the days when we could touch his wounds, as Thomas insisted on doing, are gone. Finally, it is a fact that this unknown woman with her alabaster jar is remembered wherever the gospel is preached. During Holy Week, when the passion story is read in churches throughout the world, people who have never heard of Genghis Khan, or Napoleon Bonaparte, or Abraham Lincoln will remember this extravagant woman who prepared Jesus for his death. The central agenda in our gospel passage is the conflict between Jesus and the disciples. They were confused about the facts. Jesus knew that he was heading toward Jerusalem and death. Furthermore, he knew that his death would become a main ingredient in the gospel that would be preached to the world. It is not surprising to us that Jesus knew what the facts of his future were, but what is surprising is that the extravagant woman seemed to know them as well. Somehow this woman knew the central fact– that Jesus was soon to die and that in his death the foundations of our world would be shaken. The disciples saw the facts differently. They just could not get it through their heads that Jesus had to die. Maybe it was because he was their leader and friend, or because they did not want to be a part of what seemed to be a losing enterprise, or because they assumed that they might have to suffer and die too. For whatever reason, they did not see the death of Jesus yawning before them, but only the fact of that oil dripping down on the floor, like so much money that should have gone for the poor. The disciples were practical people who compared the worth of the woman’s lotion with the needs of the poor which they saw all around. We hear much about the poor in our world, enough so that we cannot doubt that they are factors in our lives. There are grown men and women in all our cities and towns who do not have much to eat or a warm place to sleep. There are the chronic poor in the countryside, living in squalid houses, fighting the cold with threadbare clothes. To know of poor children is the worst; pictures of emaciated little ones staring out at us from saucer eyes, begging for even a shadow of our daily blessings. 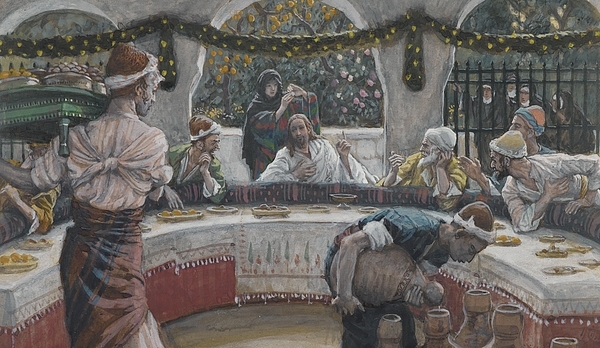 We often learn of the poor these days, poor that mock our plenty with their rags, poor that cannot help but tug on our conscience and remind us of what Jesus said about the “least of these.” The poor are a fact in our lives, and we cannot help but suspect that the disciples were right to call the extravagant woman into question. It is not hard to imagine the Christian wisdom of selling her ointment and giving the money to the poor. Yet, Jesus rebuked his disciples and let all that costly ointment flow down over his head like so many dollars and cents, like so many meals-on-wheels going to waste. Jesus rebuked his practical disciples and made this unknown woman a heroine of Holy Week forever-after. How can this be? We don’t know much about the extravagant woman, but we can be quite sure that she understood that there are facts. That is, she must have understood that while there are plenty of poor in the world, and that it is the obligation of all God-fearing people to reach out to them in the bitterness of their poverty, the primary fact just then, at the beginning of the first Holy Week, was the death of Jesus. Somehow she knew that the atoning power of the death of Jesus is the fact beyond all others, the sad and joyful reality which draws all other sadness to itself, the fact in which we have our hope. She must have known that Jesus was heading toward death on behalf of all people, especially on behalf of the poor, in order to give the bread of life even to those who have no bread. “Why this waste?” cried the disciples. But for one crystal moment this extravagant woman knew that Jesus’ way of sorrows would not be a waste at all, but the guarantee of the world’s salvation.